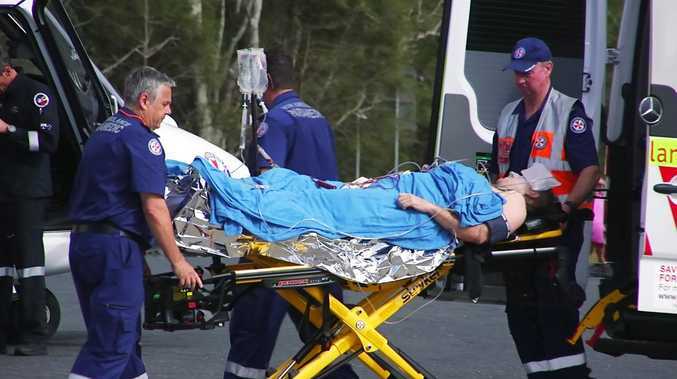 A father-of-three who had previously called himself "shark bait" is lucky to be alive after he was mauled by a shark on the state's mid-north coast. Joel "Sonny" Mason, 36, lost so much blood that he had to be given a blood transfusion on the beach after his right thigh and lower leg were bitten by an unidentified shark at 7.15am. 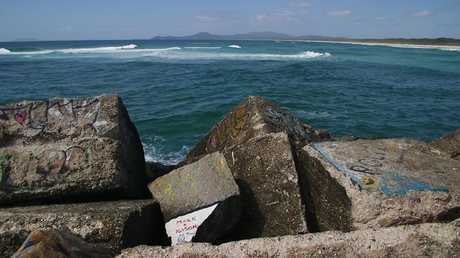 He was leaving the water at "The Bar" break at Scotts Head Beach at Nambucca Heads when he was savaged. 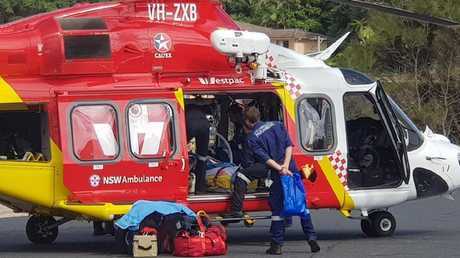 NSW Ambulance Chief Inspector Brian Parsell said that the former lifeguard and Bowraville High School sports teacher "lost a fair amount of blood" in the attack, which left him fighting for his life on the rocks. Mr Mason with wife Nicole and two of his children. "We were, along with the bystanders, able to stop the bleeding and start fluid replacement," he said. "As you can imagine, any shark bite is significant." Mr Mason, who is originally from Copacabana on the Central Coast, managed to swim to a nearby break wall, where he was able to call out to bystanders. A off-duty lifeguard was able to quickly apply a makeshift tourniquet at the scene using Mr Mason's surfboard leg-rope. Paramedics said that if the tourniquet had not been applied by the quick-thinking lifeguard, Mr Mason would have died. 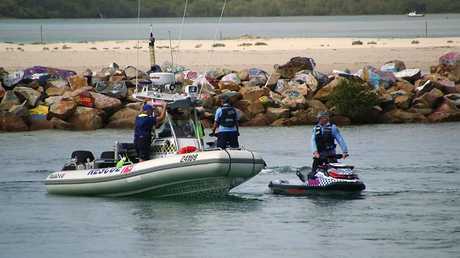 A surfer has been bitten by a shark on the NSW mid north coast. Mr Mason was rushed by helicopter to John Hunter Hospital in Newcastle, where he remained last night in a serious but stable condition after emergency surgery. He will require further surgery in the coming days. 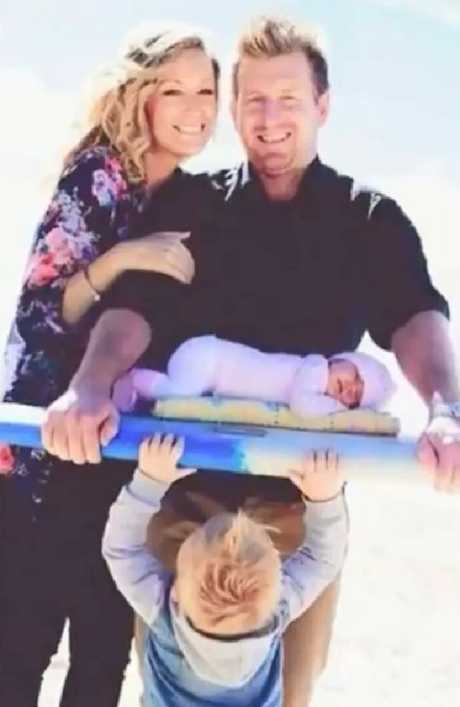 Mr Mason broke the news of the attack to his wife Nicole and three children during a video call from an ambulance stretcher. 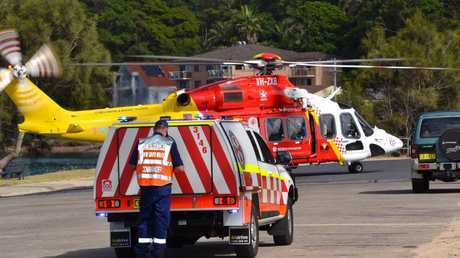 The helicopter had to stop at Port Macquarie to collect more blood for Mr Mason. 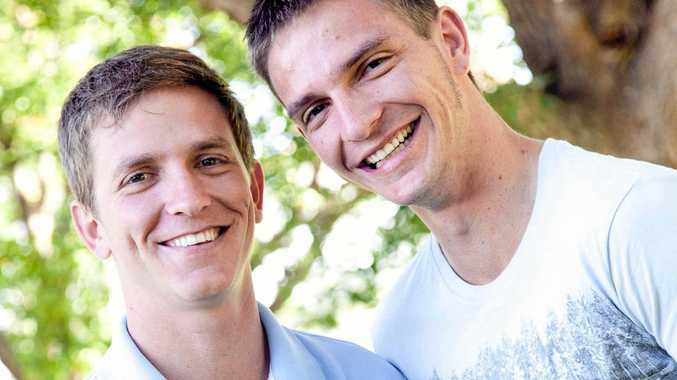 Mr Mason's father, Rob Mason, said that the moment he heard the news was "deeply disturbing". "He loves to surf early and he loves to surf by himself, which is a bit risky," he said. "He says he's shark bait, but he's prepared to take the risk and he does." Beaches in the area were closed yesterday. While authorities have not yet determined what species of shark is responsible for the attack, the area is a notorious hotspot for bull sharks. Phil Alterator, 67, and his son Nathan, 35, were paddleboarding in the Nambucca River about 500m upstream from the attack. They said the area had a "bad reputation" for sharks. "We got told that a man had been bitten by a shark, likely a bull shark, so right at the very mouth of the river and it has a pretty bad reputation for sharks," Nathan Alterator said.